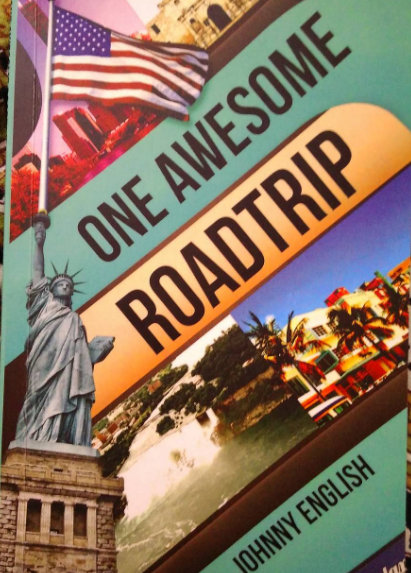 I got this book, titled One Awesome RoadTrip for review from NotionPress. It is a 117 page book detailing the road trip in the united states, undertaken by Author Johnny English and this post is a detailed review of this book. One Awesome RoadTrip opens with a prologue that talks about US Trip planning exercise of the author. I could immediately connect with him on this, as our thinking are exactly the same. Author explains the tactics involved in identifying cheap airfares and hotel bookings, sharing meals, not pre-booking hotels from previous day for a 4 AM arrival, booking cheapest car & room and hoping for an upgrade, where and how to save a few dollars and more. I do the exact thing when I plan my trips. Author has been very straight forward in explaining what is good and what is not good- like AirBnb charging entire amount to one's credit card even before hosts confirming the stay, United Airlines charging extra for check in bags and so on. Prologue over, Chapter 1 begins with author and his wife arriving in JFK. I feel some introduction about the author up front would have been nice. We get some details about the author's background only in between the story (That is is UK born, worked/ran business in Australia and Africa, married to an African women and so on). Also there was no exact reference to date and year of the trip, but given there was a mention of 1995 and 19 years ago, I interpret that the journey happened in 2014. The roadtrip lasts 31 days, covering several states of the united states, narrated under 6 different chapters. It is not done entirely on a car- many domestic flights were used, but this book is a good reference if you are touring the US and wish to know what to see, how things work and how to save money in various cities of the United States. Because author had been to US earlier, he gives reference of things where possible, explaining how things have changed over the decades. There are lots of minute details carefully collected and shared in the book- for example, number of benches and lamp posts in New York Central park, (Apparently there are 9000 benches and 1600 lamp posts in this massive park)how to interpret the numbering of Manhattan streets, exact amount paid to various tickets and purchases and so on. This chapter also shares lots of little known facts about Grand Central station. Looks like author missed to mention the pre-registration process required to visit 9/11 memorial. When I visited, I had to pre-register as no of people allowed in was limited. Author also suggests not to buy sim cards around Empire State Building as he found a cheaper deal few blocks away. Read the book to know about rooftop bars with no cover charges, near Empire State building, offering great views for little or no cost. Author expressed how he saved money ordering one meal and sharing with his wife, as the quantities in US were huge for one person. He rightly says that this approach is not appreciated in many parts of the world. Like this, there are several crucial information, cost saving tips and real experiences all around, which can be put to real use when you visit the states on tight budget. After spending 4 days in NY + Niagara falls, the author and his wife fly into Chicago where they would spend their next 3 days. The chapter covers places to visit (mostly museums), local transportation and food/drink to experience. Chapter 3 covers New Orleans, Chapter 4 covers Florida- Miami, Jacksonville, Tampa etc, Chapter 5: Charlston and Chapter 6, Texas. There are good details abour RV camping (road trip with recreational vehicles). Author also mentions motels owned by Indians. Unfortunately, their website, http://www.oneawesomeroadtrip.com/ which is said to have colour photos of the trip and photo numbers referenced througout the book, doesn't seem to be working. The book doesn't include any out of the world/extra ordinary experience or adventures but it gives a very clear idea of how things work in US, what to keep in mind during the road trips and so on. Below is a rough map of cities covered in this book. The roadtrip focused on east coast only and didn't cover west coast- San Fransico, Vegas, Grand Canyon, Washington etc. But then whatever cities they visited, they covered in considerabe details, which is great. Throughout the trip, Johnny English (name not to be confused with English movie of same name starring Rowan Atkinson) has used AirBnb the most for his accomodation needs, booking.com/tripadvisor in some cases. There is lot we can learn from his experience on this road trip- if we ever trip the US east coast, we can save lots of dollars thanks to tips provided in the book. The book also inspires us to document the details of our travel and share it with others- either as a blog or as a book. NotionPress is a popular Chennai based publisher, extensively promoting self-publishing and supporting new authors. With more than 1500 titles published and sold over 100 countries. NotionPress team has the right reach to promote books. All these in less than 5 years, which is amazing.